I always prefer to use ready to use batter for Idli or Dosa. Similarly for Paniyaram too. 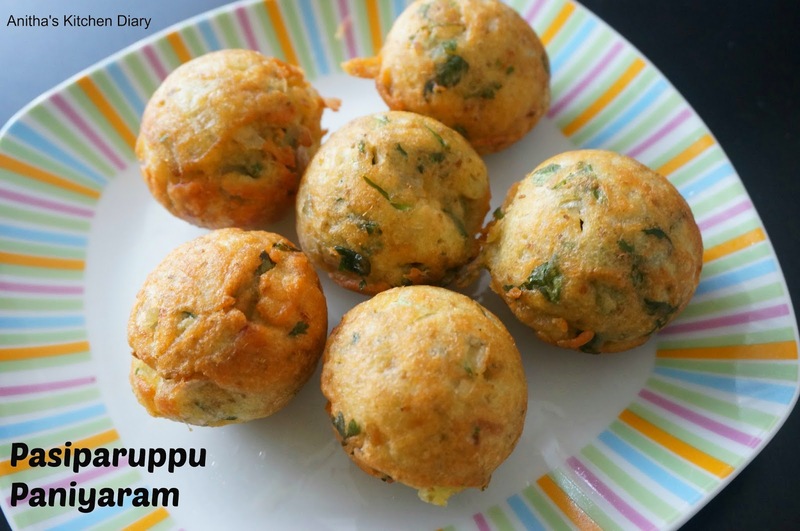 This Pasiparuppu paniyaram is also a ready to use batter .I got this recipe from here. and modified according to my taste bud. Wash and soak moong dal for 2-3 hours. Grind Moong dal with green chilli and fennel seeds as a coarse paste. Add chopped onion ,coriander leaves ,ginger and rice flour to the batter. Add required salt and mix well. Heat paniyaram pan and pour oil in each moulds. Drop spoonful of batter into moulds and cook on medium flame. Flip it and cook on other side . Serve it along with chutney of your choice.